Numerous Chinese publications, including The Sixth Tone and NBD News, have reported that ‘ghost drivers’ are frightening Uber passengers into paying for trips they didn’t even take. 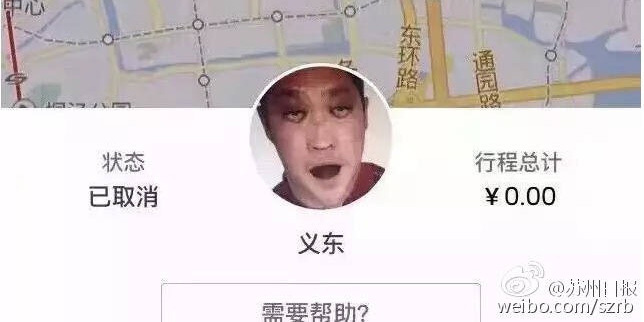 Some passengers in Tianjin, Qingdao, Chengdu, Beijing, Shanghai and Suzhou have been canceling Uber rides after seeing creepy driver profile pictures pop up in the app. The photos depict horrific zombie-like faces, which turn users off instantly and prompt them to ditch their trip, thereby incurring a nominal cancellation fee that goes to the driver. Uber acknowledged the phenomenon and told The Sixth Note that it is “collecting all kinds of evidence and will pass them on the public security department.” The company also said that customers will receive refunds when they report such incidents through the app. Quartz noted that in April, Uber rolled out a facial recognition feature in the driver-side app, which matches drivers’ faces to their profile pictures when they sign up. It also runs periodical facial recognition tests to ensure that the person in the driver’s seat is the same one as in the photo associated with that profile. But it’s clear that some drivers in China have figured out a way around this, in the hope of making a quick buck. In some countries, Uber incentivizes drivers with bonuses paid out when they complete a certain number of trips per day. It’s possible that drivers in China are resorting to scams like this to reach those targets. However, I’ve been told by drivers in some Indian cities like Bangalore and Mumbai that Uber offers incentives based on daily earnings; if they bring in a certain amount through any number of trips, they receive a bonus. There are apparently multiple tiers of bonuses, depending on how much a driver earns in a day. If that’s the case, it could lessen the need for drivers to rush passengers, hurry while driving or resort to scams to some degree. But no matter how clever a scheme cab companies come up with, human nature will likely drive us to find a way to beat the system.